By default, all the images in the exposure cells are the same, by definition, they are only a "link" on the head image. 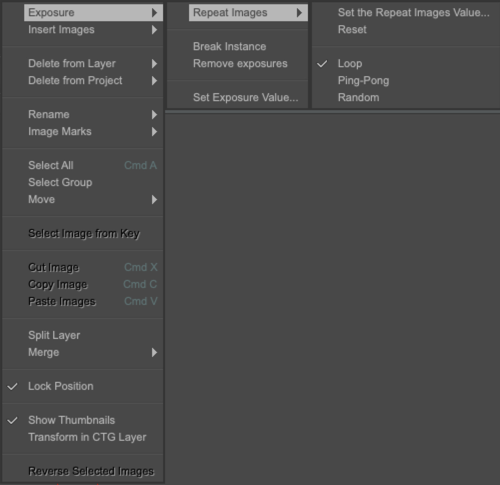 However, this feature allows to use the previous images of an instance, in its exposure cells. This option is really useful, in particular when a character stops moving, but whose the lines still shake (a graphical aspect very appreciated by traditional animators). This is made possible by the Repeat Images Value option available in the timeline's contextual menu. That value is applied on the wished exposure cell (you cannot use that value on the instance's head). The third exposure cell contains a blue circle, the sixth one will contain a red rectangle etc... and this repetition will loop as long as the instance will have exposure cells. You can also set different behaviors than Repeat, such as Ping-Pong and Random.